On my way from Chicago to Minneapolis I drove past the Wisconsin Dells and decided to stop there for lunch. The Wisconsin Dells is the Waterpark Capital of the World. I was more interested in the cheese. 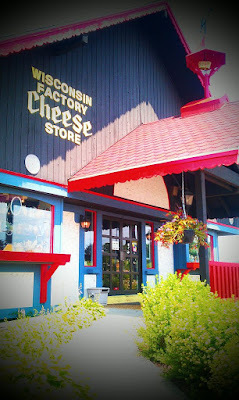 Driving through Wisconsin you'll find cheese houses, shops and factory tours off just about every exit of the highway. And I've stopped at many of them over the years. Wisconsinites and Packers fans are called "cheese heads" for a reason! 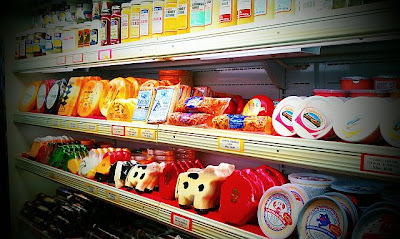 I am kind of cheese obsessed! Me and Cheddar cheese... and mozzerlla.. we are just the best of friends! I need to go Wisconsin one day for real! 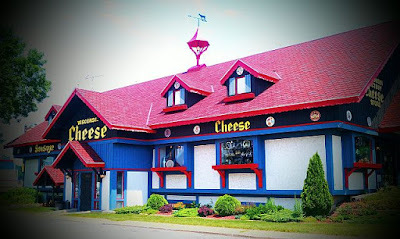 i wouldn't be able to leave due to my love of all things cheese...that is AWESOME!!! I just died! I love cheese so much, I am that girl that will spend an entire pay check on cheese. Oh sounds like Heaven! I love cheese entirely too much as well! I would be in Heaven!! I LOVE cheese! Heaven, pure heaven! I like how you make the most of your trips. Spontaniety keeps these long travels fun, I'm sure! 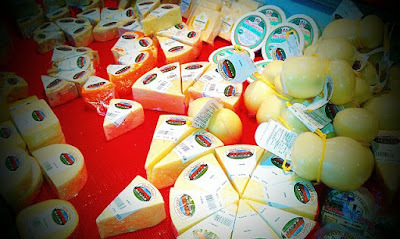 OMG - that is definitely a cheeseheads heaven! How many did you end up buying?!?! I LOVE your blog and your furbaby Cali is so cute! I have a yorkie too, they're just so precious :) I found you through Fairy Tales are True and so glad to be a new follower!